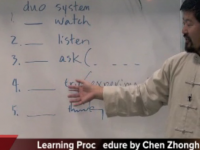 Master Chen’s disciple Ping Wei recently wrote an article regarding how to rotate the Kua and create a stable center (pivot point). The idea is simple: the center will never be stable if you try to control it by only one Kua, you have to have good control of both Kua, and move them both at the same time. Such a simple idea doesn’t take a genius to understand. So that I read the article, got the idea, and I thought I got it. Last Sunday Ping flew all the way from Phoenix to LA to give us a workshop. Just like he always did, the first thing in the morning he taught us the most important concept in this workshop – to control both Kua instead of one. Which I thought it’s not bad to listen to it again, see how he actually demonstrate it and try it myself. I actually thought I was doing good. But not until the end of the day that I realized I didn’t really “get it” this whole time. Towards the end of the day when we were practicing Block Touching the Coat, ping demonstrated how we can lift the opponent up by having a pivoting point on our forearm. The setup is like this: my right arm is pointing downwards in front of my belly, the opponent caught my wrist with both hands. Following Ping’s instruction, if I put my left arm underneath my right arm as a pivot point and sink my elbow, I’m able to lift the opponent up fairly easy. But without that left arm helping, I just can’t make it work. At this point, luckily I thought about what he taught us in the morning – “to control both ends, so the pivot point can be stable”. So I tried to control my hand and my elbow to move at the same time, If the hand raise 1 inch, the elbow has to drop 1 inch as well. Then I tried to do this on my Kua, I was able to lift the opponent up. Tested this same concept on 6 sealing 4 closing, It works a lot better as well. At this moment I finally realized that I really didn’t get it this whole time, there’s a huge gap between “ok, that maks sense” and really able to apply it, utilize it, and blend the concept into my Taiji. Master Chen once said that the movement should be at where the opponent is not. When I want to step forward and the opponent is blocking in front of me, my torso, where the opponent is pushing against, should not move with my foot. I think it can be considered as an extension between my steps. When I want to move my torso into the position, instead of moving my torso directly, I should move my front knee forward with my back knee staying at the same place. That’s extension between my knees. It also brings my torso forward and downward. Once those are done, I can extend my arm with my other body parts not moving, the opponent will be squeezed away. To press the shoulders down is very important. If you don’t press the shoulder down after the 3rd move of the 3-count negative circle, your hand and body won’t be able to connect and continue onto the 1st move of the next circle. If you don’t press the shoulder down during the 3rd move of the 3-count positive/negative circle, you won’t be able to extend your hand out. Recently I was focusing on first keeping my torso not moving, only move my hands. Then keep my hand not moving, only open or spin my torso. But I was confused about how to combine it with rotating the Kua. The answer I got from Ping was “they’re both correct, but at the different level”. The torso is way bigger than a point between both kua, so it’s a lot easier to keep it not moving as a beginner. But we need to move onto the next level, instead of satisfying with easier movement.